Ivan, Jennifer and I had lunch at Gado Gado Cemara on June 12, 2009. 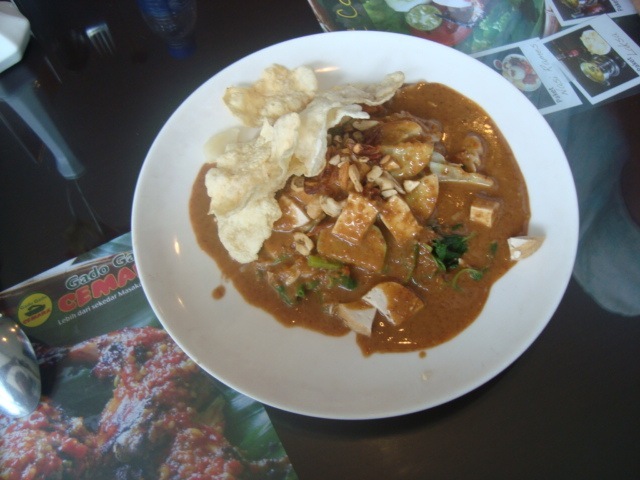 Ivan and Jennifer started off with the Gado Gado which is tofu, cucumber and peanut sauce. Ivan got the Nasi Goreng Asin (Asin means salty). Jennifer got the Soto Ayam which is a soup with chicken, clear thin noodles and onions. I got the Nasi Goreng Ayam (Ayam means chicken) and I added bananas to it. The food was good. We took a taxi to the Jakarta Fair 2009. We got there just before the ticket went on sale, so we had to wait for a little while in the line before we could buy our tickets. Once we brought our tickets, we made our way inside. The fair covers a big area. We checked out everything. 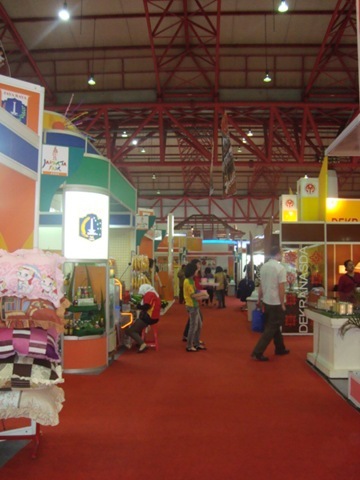 It was like trade fair..but not just for businesses…basically it was like a showcase for Jakarta and Indonesia. There were these wooden souvenirs that were really cool. Too bad they were so heavy or Ivan probably would have bought something. Jennifer bought some cool souvenirs. There are lots of girls offering free samples of products. Most of the food items were kinda weird. We rode the bumper cars. I rode with Ivan. It was lots of fun. 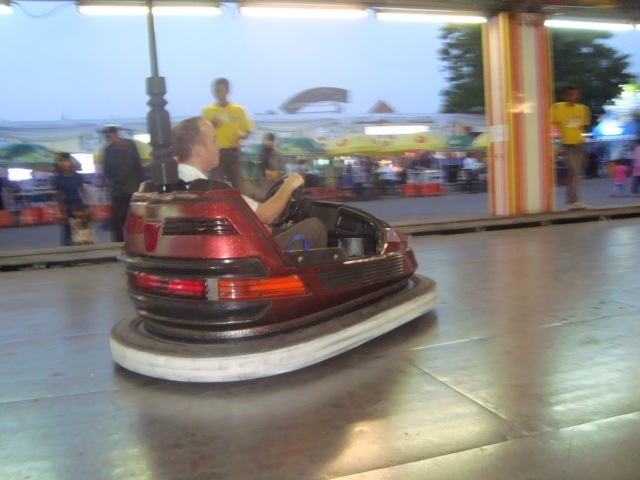 Ivan even let me drive for a bit, while he had hit foot on the gas. We took a taxi back to the hotel. Ivan wasn’t feeling good – he had a fever. We got some food at the convenience store nearby. We had cup of noodles for dinner. I went to bed early. Ivan and Jennifer watched the movie Super Size Me. Ivan had breakfast in the room on June 13, 2009. He had a vegetable omelette and toast. 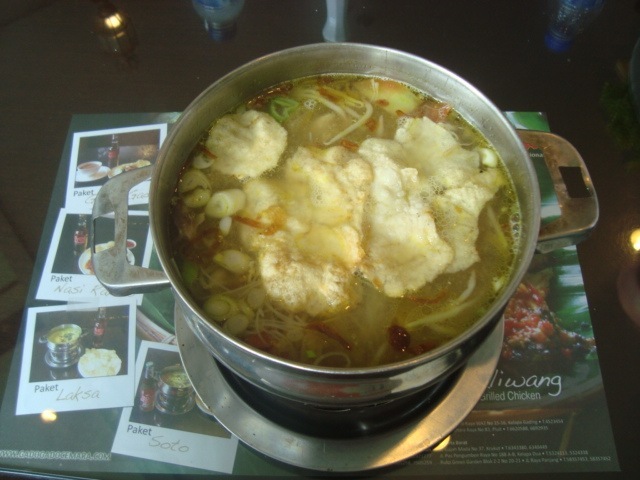 Jennifer and I went to Gado Gado Cemara for lunch. I ordered a spicy Laksa soup with bananas. 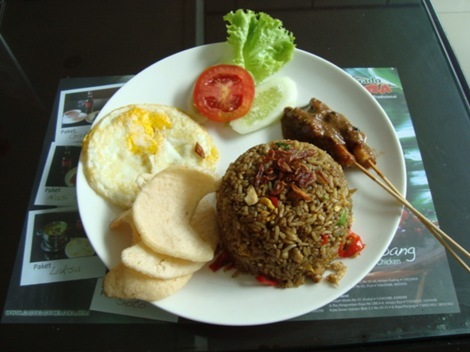 Jennifer got the Nasi Goreng Special. The food was tasty. We chilled out in the room. Ivan still wasn’t feeling well and so didn’t really feel like doing much. We walked to Chili’s for dinner. It’s only a 5 minute walk away from the hotel. Ivan ordered the chicken fajitas. I had the banana salad. 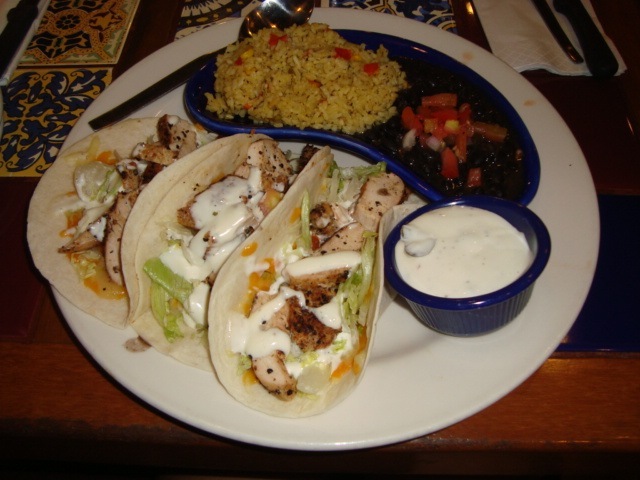 Jennifer had southwestern chicken tacos. The food tasted pretty good and it was nice to have some non-Indonesian food for a change. We were going to spend the evening in the hotel room – but then Ivan decided that he felt better, so we went to the Ritz Carlton. There’s a lounge there with a Canadian band called Exit-t and they were playing there that evening. Ivan also got to see them the other night with Yogi. The entrance is 100,000 IDR which includes one drink. The band consists of two girl singers, a guy singer, bassist, guitarist, keyboard player and a drummer. We ordered some fruity drinks. I had a virgin banana daiquirri. Jennifer really liked the Berry Ferrari. 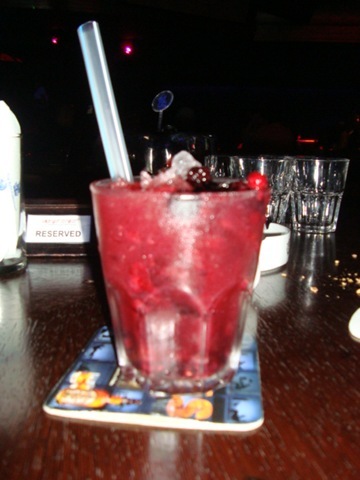 It had fresh berries in it. The band sound awesome. They sound just like whatever band or singer they’re performing. The band sang We are the Champions by Queen, Ironic by Alanis Morrissette, I Will Survive, Say a Little Prayer and Gangster’s Paradise by Coolio. Jennifer liked that their outfits had the same colors or similar designs. Also, that they seemed to have a cool dance for almost every song. 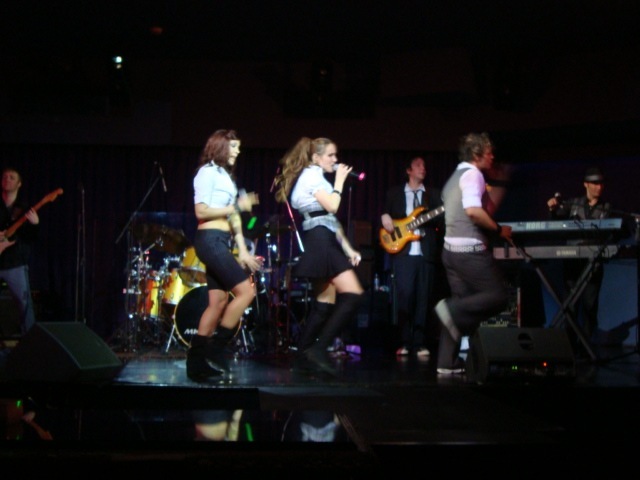 The band liked to interact with the audience as well. This band is definitely the best cover band we’ve seen on our trip. We left the lounge at 3 am to get some rest. 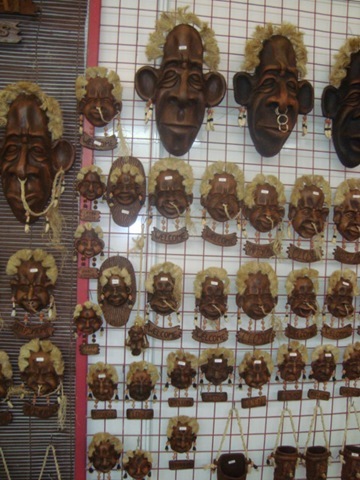 Those wooden mask souvenirs looks like they were based on you Dave! If you say so! I don’t look weird like that, do I?